I didn't mention yesterday, did I, the wrap-ups that two of my beer blogging buddies from San Francisco wrote after our meetup last Monday in San Francisco? Here they are for your reading pleasure and their take on the fine Pennsylvania brews that I introduced to them: Jay Hinman's at Hedonist Beer Jive and, Brian Yaeger's at Beer Odyssey. 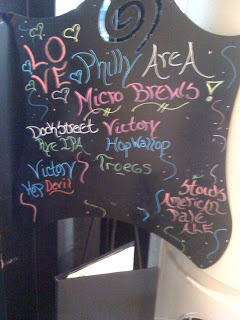 Of late, I wouldn't have much to say about the beer selection in Philly's International Airport (PHL). However, as I always am wont to do, I cruise the airport bars, make note of the draft beers available (bottles...at least, better ones...are typically not aplenty at airports) and submit them over to Richard Steuven's website where he keeps a database of such things, among others. If you find yourself thirsty while traveling through airports, this could be very useful for you. Since the departure of the Independence Beer Bar (not to be confused with the former brewpub in Center City) last year, the options for a good glass of beer at PHL has gone down significantly. Not that Independence was much better than average (or slightly better, if I was being generous) on any given day, but it certainly did represent some of the better local offerings from Stoudt's to Yards to Victory to Lancaster and beyond. But, last week at the Jet Rock in Terminal E, more taps were catching my eye than typically have done in recent months. Take, for example, handles that read Dock Street Rye IPA, Anchor Steam, Victory Hop Wallop, Stoudt's APA, Dogfish 60 Minute, Sly Fox Dunkel Lager, and Tröegs Rugged Trail. Plus, with a snazzy sign out of front, it's nice to see that they are making some sort of attempt to call attention to the local beer scene. While this would be considered decent...c'mon guys. Can we please do a better job at representing the Philadelphia region at the airport, where hundreds of thousands of out-of-towners get a view of the region without ever leaving the airport? It's almost embarrassing. Like I said, last Sunday's sightings at Jet Rock were a decided improvement, but there's certainly more work to be done. Later this week, I'll regale you with a story of what I may be considering the country's best airport beer bar. I'll leave you with a hint...it's west of the Mississippi. Moving on to San Francisco (that's not part of the hint!). 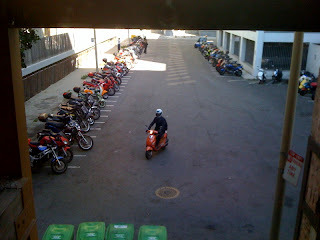 Okay, let's get back down to ground here in San Francisco. Afterall, we're only meant to spend a brief amount of time in airports anyway, right? If my flight arrangements had been better planned, I would have been at AT&T Park watching the Giants play a Sunday afternoon game while munching on garlic fries and washing it down with a beer from Firestone, Lagunitas, or Anchor. Yes, behind Philadelphia, I believe it's fairly safe to say that the Giants park has the next best ballpark beer selection in the country. I haven't sampled them all, but enough to feel comfortable making that statement. Instead, it was a burrito in the Phoenix airport which held me over until I strolled to the 21st Amendment brewpub, just blocks from AT&T Park, around 7 p.m. There was still a buzzing after-game crowd hanging around, partly I'm sure for the live musical entertainment in the side street and partly because it was just such a darn nice weather day (which was theme for all 5 days that I was in the Bay Area...goodbye East Coast rain). Sort of reminded me of what McFadden's at Citizens Bank Park would look like on a similar night after a Phillies day game. I knew going into this week of San Franciscan treats that it would include an entry into my Watermelon Wheat experiment. See, if you haven't been keeping up around here, the 21A canned beers (this beer, as well as the Brew Free or Die I.P.A.---via Minnesota) began in June to be distributed in Pennsylvania. First up was a can (or was it several?!) during tailgating for Jimmy Buffett concert the day before leaving to California. Next was this draft version fresh at the source. This would be followed up with another draft version (but, again, via Minnesota) at The Drafting Room back home the day after I returned. To which I say, of course, "Get Over It." It's not a fruit beer. While there's an undercurrent (allow me stress again, un-der-curr-ent) of sweetness, the signature of this beer is the low hop bitterness profile replaced by a moderate bitterness imparted by what tastes and feels like the rind of the watermelon. This is an easy-drinking beer (read: lighter body...but carrying enough flavor to keep us all interested) that should please anyone looking for a great summertime quencher. 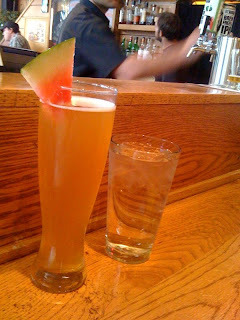 The only difference with all of these run-ins with this beer over the last week, was that at the pub, they garnish the glass with a piece of watermelon for effect. I gave the watermelon a quick dip in the brew, ate the watermelon then worked on the beer. The fresh watermelon did add just a touch more sweet flavor than the draft or canned versions possess, but not enough to throw things dramatically off. I dabbled as well in the Tasty IPA, brewed in partnership with East Bay award-winning homebrewer (and nice guy) Mike McDole. Does the name sound familiar? He's the homeberewer who won the Long Shot competition last year but had his Double IPA (Pliny clone) brewed this year by Boston Beer Co. because of the hop shortage at the time. He's also the guy, for those of you who listen on Sundays, who shows up with the brewcasters on The Brewing Network...where, if I'm not mistaken, he got tagged with the nickname of Tasty. My body was on East Coast time, so I knew by 9pm it was time to head back to the hotel. Figured I would take a different walking route back to the hotel, just off Union Square. The return would take me by Thirsty Bear, what I consider one of the city/region's unfortunately under-recognized brewpubs. For starters, the beer...I agree, in a city/region of first-class beers, they may not usually make it to the top of most beer geek lists of best in class. But, on the other hand, I can only count on a couple of fingers the number of beers I've had in almost 10 visits that I would turn away again. And, the service is always at least average, if not above average...which is what we always ask for, right? But, here is where Thirsty Bear shines in my opinion: they've got that little something extra to differentiate themselves from others. Same with the Beach Chalet (to be discussed here a few days from now). Or La Trappe. Magnolia. Etc. At Thirsty Bear, it's the Spanish cuisine and tapas...it's the weekly cask on the bar...on Sundays, it's the Flamenco musicians and dancers. I figured I'd be walking right on by Thirsty Bear on my way back to the hotel, too tired to stop in. That was, until I heard the stomping of the dancers and music from the guitar---they pulled me right in. The music, the singing, the clapping, and the dancing. If you are in San Francisco on a Sunday night, The Brew Lounge highly recommends stopping in for this unique brewpub entertainment. Right in to a surprisingly crowded bar. Surprised because of all the times I've been there (usually "odd" times of the day or night), the crowd has been more to the thin side of populated. So, the music was enticingly-pulsing and the atmosphere was too. Just a barstool at the end of the bar was open for me to slide in to, where I was able to quickly check out the Howard Street I.P.A. After getting a little hopped up over at the 21A, it was where my palate was at the time. This citrusy I.P.A. at Thirsty Bear did not disappoint. Neither did my last beer of the evening, which was recommended by Steve (did I get the name right?). The Farmhouse Ale (a specialty Bière de Garde) carried a nice and subtle tartness and mild undercurrent of musty goodness. Well done. With the Flamenco entertainment wrapping things up, I knew that the time had passed for me to now do the same. My internal clock was already being messed with, and it was only the beginning of the week. i just had the 21st a watermelon wheat at the drafting room and was pleasantly surprised, i great summer beer. i second your comments.